This Spring, the minnies celebrate their First Communion. They're so excited about it and have prepared for this important day with classes and a retreat. It's such an important day. I was reminiscing about their baptism the other day and found some pictures to share with you. You probably already know that they girls were born in Mexico City, although we were living in Oaxaca, Mexico at the time. 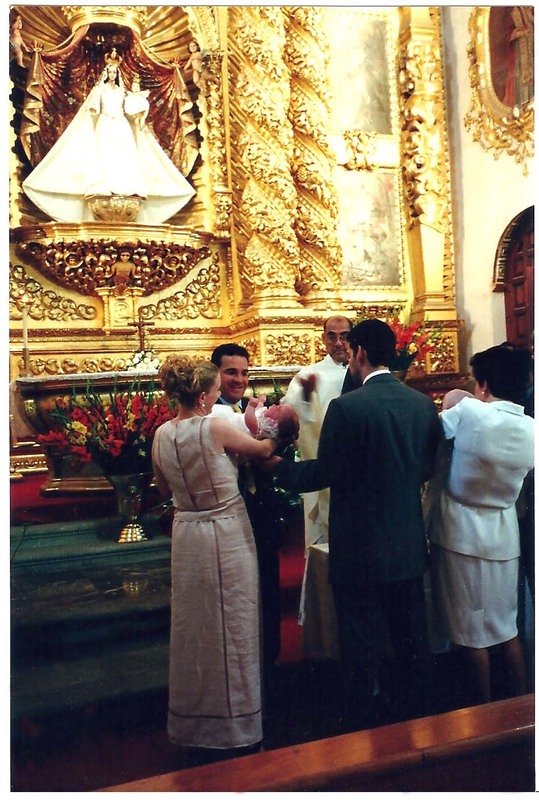 When they were 4 months old, the girls were baptized in the Capilla del Rosario at the Temple of Santo Domingo in Oaxaca. 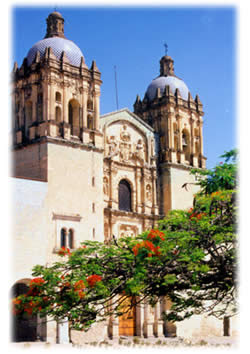 This church is arguably one of the most beautiful in Mexico, or perhaps the entire world. The Dominican order began construction of the church in 1570. As is the custom in Mexico, we waited outside of the church to greet family and friends. Once the priest arrived, we all entered the church at the same time. My family came from Maryland to the special event along with other guests from Mexico City and Guadalajara. Natalia slept through much of the mass while Alexia cried! I tried to calm her with a pacifier and a drink with some success. It was a beautiful service and I was blessed to be surrounded by so many people who love the girls. 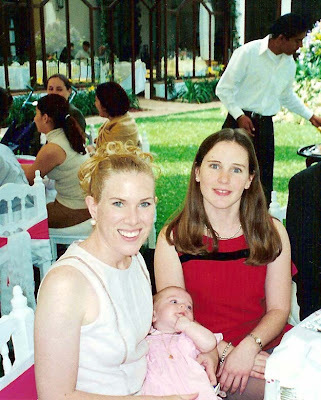 The party was in a beautiful garden at Hacienda de los Laureles where we enjoyed the 80 degree weather in January. Guests enjoyed a myriad of culinary delights from Oaxaca’s seven regions while listening to a string quartet. Carlos Guzman organized the décor and staged the event. I had forgotten that the colors were yellow and pink. That is a pretty combination, especially when paired with pewter. Guests took the pink rebozo shawls with them as a favor. This is my adorable sister with Natalia. Here we are with Miss Alexia who changed into her smocked dress after a few hours at the party. Parties in Mexico last for the entire afternoon and often have several different musical acts or activities. It was a beautiful day and I’m looking forward to the First Communion celebration. It’s the next step in the girls' religious formation and a rite of passage so to speak. What are some important celebrations in your family? Congratulations on your daughters' First Communion - a very special day indeed! We are Catholic as well, so sacraments are big celebrations in our home. Enjoy the big day! We are preparing for daughter's confirmation on May 29th! beautiful pictures! I still remember my first communion-it's a big deal for a little girl! I'm sure your daughters will be wearing beautiful dresses too! What a special post! I loved these photos and I'm so excited for their first communion!!! I can't wait to see what they wear! What special memories! I can't wait to see photos of their first communion. As a mom, I know how precious these moments are. My oldest was an angel for his baptism; My twins screamed through theirs last year. Our parents came for the weekend, and it was the first time my dad had gotten to see the babies, which made it extra special. Thanks to everyone for all of the kind words. Steph ~ Congratulations on your daughter's confirmation. Tara ~ Crying must be a twin thing!!! My twins are making their first communion this spring also. Such and exciting milestone! One of your girls looks JUST LIKE your sister!